The Utah State University Eastern Golden Eagles men’s basketball team officially ended the regular season and are preparing for the Scenic West Athletic Conference basketball tournament. The regular season went fairly well for the Eagles, finishing this weekend 20-9, and a conference record of 7-8, beating each team in the SWAC at least once during the three-game series with each team. The Golden Eagles played their final home game of the season against the Colorado Northwestern Community College Spartans. After losing to the Spartans in their most recent meeting, USU Eastern was certainly looking for vengeance and for a spark that would help them through the final three games of the season. The team certainly found that spark against the Spartans as they shot over 50 percent from the field throughout the game. There was a slight scuffle between the Spartans and the Eagles, which led to players from both benches being held back from entering the court and the eventual ejection of Eastern’s Kurtis Ellis for leaving the bench. At the final buzzer, the Eagles had three players finish with point totals in double digits, led by Kendahl Amerson with 20 points, while Todd Helgesen lead the Eagles with 11 rebounds. The final score on sophomore night had USU Eastern defeating CNCC 81-63. The team started their final weekend of the season on the road facing the Salt Lake Community College Bruins. At game time, the Bruins were the one team in the SWAC that the Golden Eagles had not beat at least once. The game at SLCC became a shooting-fest for the Golden Eagles, hitting 46 percent of their shots while holding the Bruins to only 35 percent. The Golden Eagles had four players finish with double-digit point totals led by Amerson and Trahmier Burrell, who were the leaders with 18 points apiece. Nafis Walker brought down 11 rebounds, leading the team in that category, all coming from the defensive end. 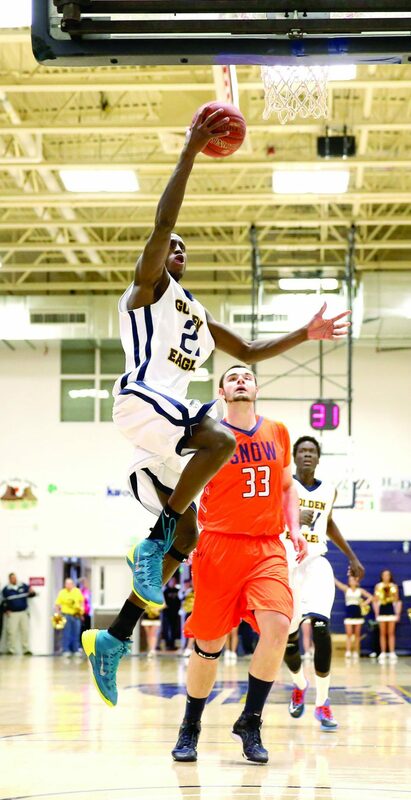 At the end of the game, the Golden Eagles defeated SLCC 78-63. The final game of the regular season pitted the Golden Eagles against their rivals from the other side of the mountain, the Snow College Badgers. USU Eastern had a tough time shooting the ball, only hitting 39 percent of their shots from the field while allowing the Badgers to connect on almost 56 percent of their shots. While the Eagles had a tough time shooting, they did have four players finish with double-digit point totals. They were led by Teotino Do with 12 points. Josh Van Weezep connected on three-for-three shots from behind the three-point arc. The Badgers defeated the Golden Eagles 79-69. USU Eastern will take the fourth seed going into the SWAC Tournament where they will play the host team, Snow College, in the first round on Thursday, Feb. 27, 2014. To win the conference, the Eagles will have to play, and win, three games in three days. They will have to go through Snow College, the number five seed, in the first round, the College of Southern Idaho, number one seed, in the second round and in the finals, they could face the CNCC Spartans, number six seed, SLCC Bruins, number two seed, or the North Idaho College Cardinals who rounds out the list as the number three seed.